Step 1 In a large bowl, combine the peppercorns, nutmeg, allspice, cinnamon, cloves, salt, sugar, peppers, garlic, ginger, scallions, oil, lime zest and juice, vinegar and rum. Add the chicken pieces and toss to coat. Step 2 Place the chicken and marinade in a large, sealable plastic bag. Squeeze out the air and seal the bag. Place the bag in the refrigerator and marinate the chicken overnight, up to 24 hours. Step 3Remove the chicken from the marinade and grill on an oiled rack over medium-high heat until the meat is firm and the juices run clear and a thermometer inserted reads 165 degrees. Remove the chicken to a platter and set aside for a few minutes before serving. In Recipes-list.com we have selected the most viewed recipes from category - Grilled Main courses . Enjoy the best recipes specially selected for you! 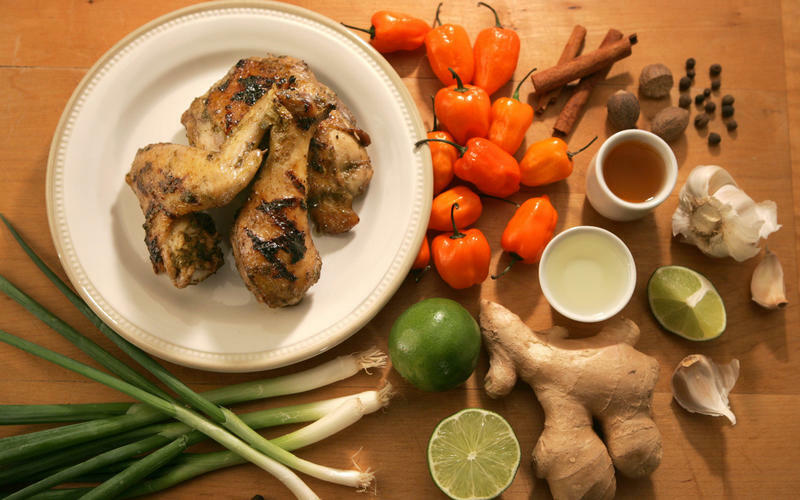 Caribbean jerk chicken is the right choice that will satisfy all your claims.